Concrete jungles, exhaust fumes, noisy traffic, and the unending assault of media. Night clubs, expensive restaurants, people everywhere- the lack of solitude. City Life. Overwhelming and overbearing; I’d rather be immersed in nature, I’d rather take a Hike. 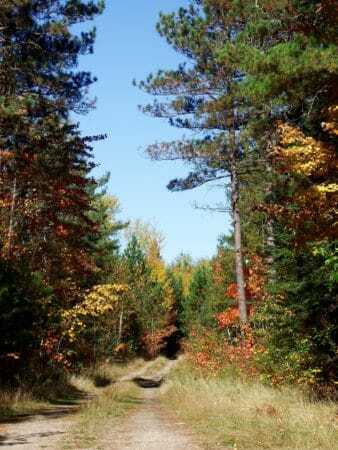 Winding paths, dirt or gravel; enveloped by a forest of trees and constant rock obstacles. The chorus of various birds assaulting my ears, while the smell of pine and other trees refreshes my nose. My heart beats fast, my breath is short; while sweat drips down my back. With each uphill climb, the cobwebs in corners of my brain are swept away; revealing things I had hidden on purpose. Therapeutically, I somehow deal with them while I hike on. The sound of water rippling a shoreline echoes in the distance; a refreshing sound that beckons me to come. As I reach the lake, a loon’s call pierces the melody of the forest. Lunch by fresh water beats a city restaurant meal, with fancy menus and hip music playing. My snack may be trail mix, salami, crackers, cheese, and fruit; but somehow it tastes more magnificent than the best sushi money can buy. Ducks, loons, and slapping water are my entertainment. The occasional chipmunk acts coy as he edges closer to my food. Why is it everything seems better on a hike? The water is more refreshing, the food more satisfying, and the exercise more fulfilling. Don’t get me wrong, I love the occasional latte, kombucha, or organic fresh juice; but if I had to choose, I would opt for the trail life. I would choose the peace that Nature gives me. Refreshed after a bite, energy returns to continue the Hike. Sun-kissed and weather beaten, my thoughts get even more deep; and the process of solving life’s problems begins. It’s amazing how trivial our own issues become, when we have the time and the silence to wade through the muddy waters of our minds. It seems we can better recognize the good in the world and in the people around us; positivity replaces negativity. When the final leg is almost done, my old hiking boots become lighter; my tired legs become stronger; and I am ready for what life throws me next. My soul is revitalized. This all sounds a bit poetic, but peace is poetic for hikers. Hiking isn’t just hiking and trails aren’t just trails. They are the entities so many of us rely on to get over the hills, sometimes mountains we must climb in life. All the prescription drugs in the world can’t mimic what Nature does for one’s well-being. These places we get to escape to, if even just for a few hours, are the places we can’t compromise. They are our utopia’s, where we can take a break from the craziness that can be this world. More people would benefit to find a trail and hike. It’s important that we recognize the value of our trails, before they are threatened by development or neglect. 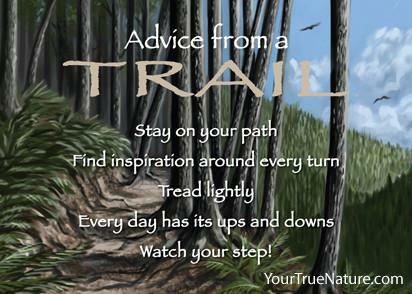 June 2nd was National Trails Day, a great time for everyone to seek out their favorite trail and spend the day on it. Something we should do throughout the year. Join others in the fight to preserve our wild places, so future generations can receive the same therapy we do. Do it for your health, the health of nature, and the health of this world. Alycia Roller is an avid hiker and lover of all things outdoors. The majority of the time you can find her outside with her black lab Minka and her husband Tom. As a believer that nature can heal many things, Alycia promotes saving the environment in her personal life and at her jobs. One of those jobs is for the company Your True Nature, who's main principle is Honor the Earth and Honor Yourself.